Hello hello. I don’t know if you remember but my sis and I were supposed to have this new thing on the blog where my film student sis shares/analyses a film and I make a dish from the film. Simple, right? No. I took forever to follow up. Hahah. 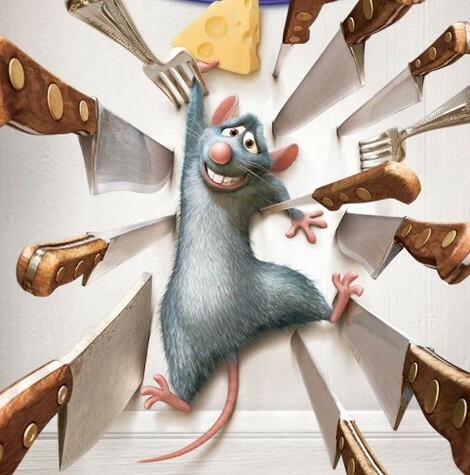 It didn’t help that the first film my sis decided to analyse was Ratatouille. I love that film, like I love most animated films. But I love it especially because of the food and the adorableness that is Remy. 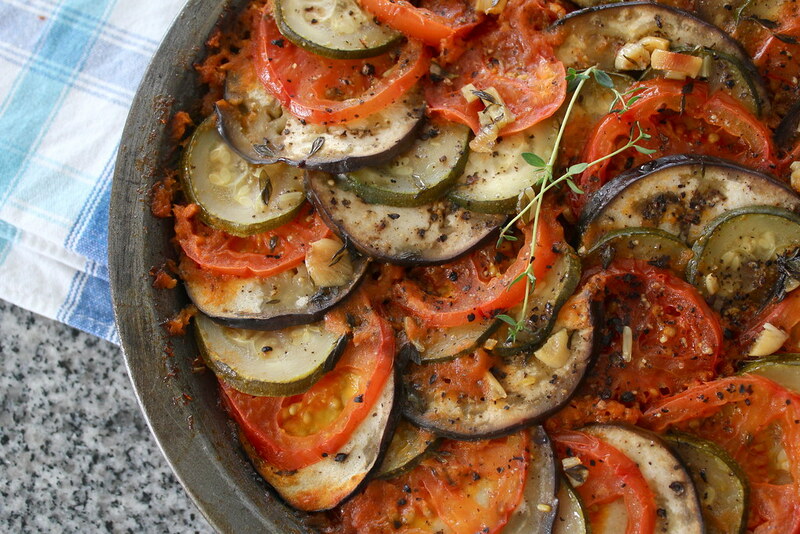 So because of my love for this film, I was quite intimidated about making ratatouille. Let’s pretend I did not take forever to do a follow up post to my sister’s writeup. If you haven’t read my sister in her writer’s zone, check (part one) it out. Sautéing the celeries, carrots and onions. Adding the basil…and the mess. You’re supposed to blend the whole thing with the basil leaves. I had a mini blender but I couldn’t find the blade. So I thought, why not use the stick blender? Hahahah…I anticipated that some sauce might scatter but my miscalculations led to sauce on the floor, the walls and myself (I really should make a habit of wearing aprons). Funny, funny. Good thing the splatter wasn’t so much and I was able to blend the whole thing in a tall plastic glass with my stick blender. Finally arranging slices! The slices that took forever. 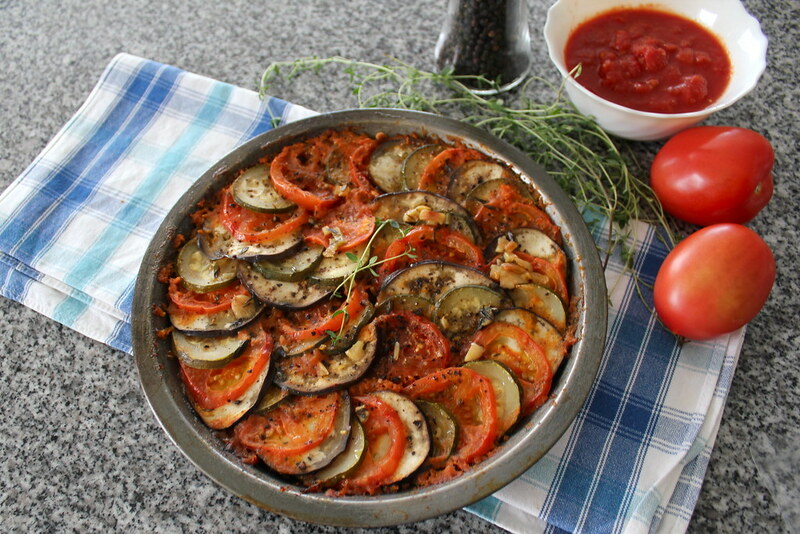 It also didn’t help that I had a massive eggplant that did not match up with the courgettes and tomatoes. They managed to look put together though. Phew. I even have a mini version. Hehehe.. The aroma of success filled the kitchen. I nervously took the foil off and voila. The flavours are amazing y’all. I can’t believe I finally made one. Next time I won’t take forever. Ratatouille off my bucket list. And the first installment of A Taste of Reel Food is done-o. My only regret is that I halved the recipe. The original recipe was for 8-10. I forgot I feel like eating for 3 sometimes. 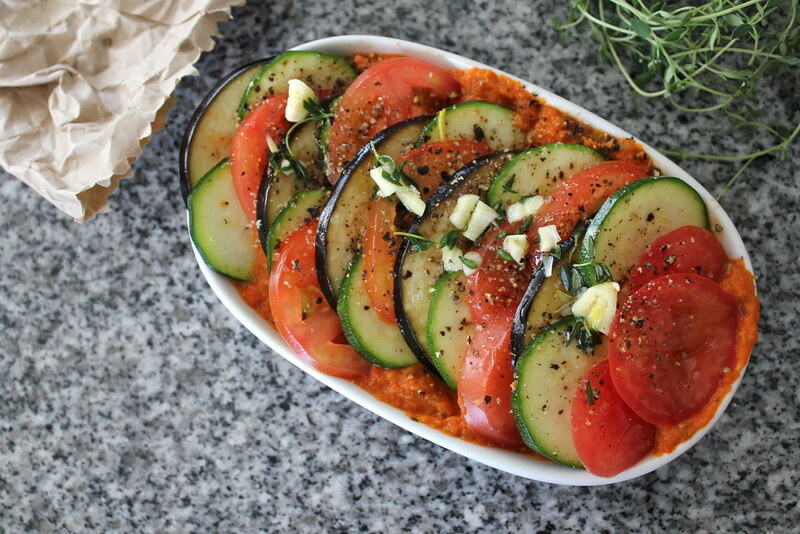 I didn’t add his spicy twist because I’ve never had ratatouille before so I want to taste it without a twist. – Preheat the oven to 230 degrees Celsius. Cut the capsicum in half and remove seeds and ribs. 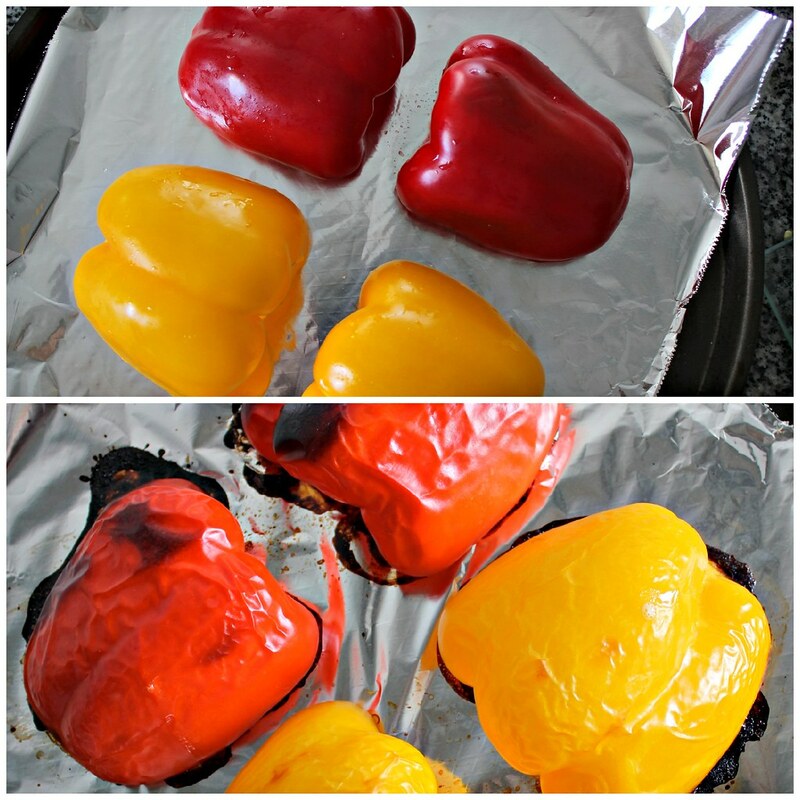 Place the capsicum halves on a foil lined sheet, cut sides down. Place on top shelf of the oven and roast for 15 minutes. Remove and let it rest until cool enough to handle and chop. – Lower oven temperature to 170 degrees Celsius. 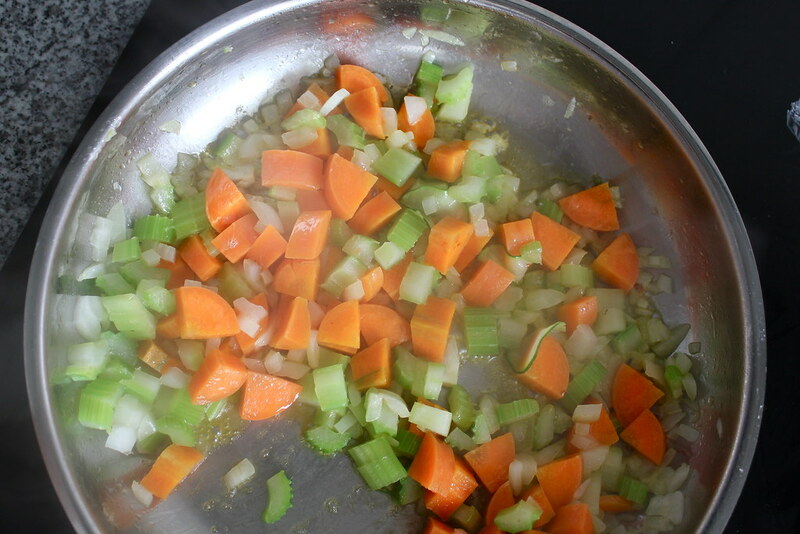 – Place butter and olive oil in a pan and sauté the chopped carrot, celery and onion over high heat for about 10 minutes. – Add garlic then cook for a minute. 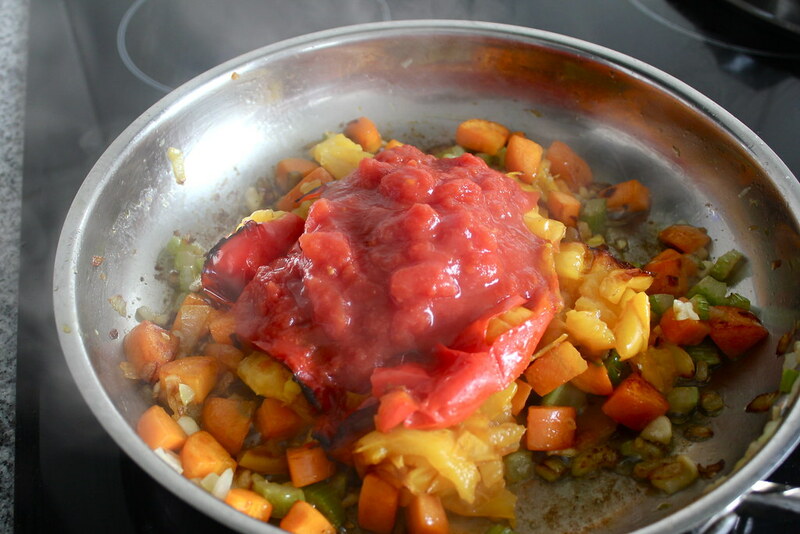 The stir in the chopped, roasted capsicums and half a can of crushed tomatoes. 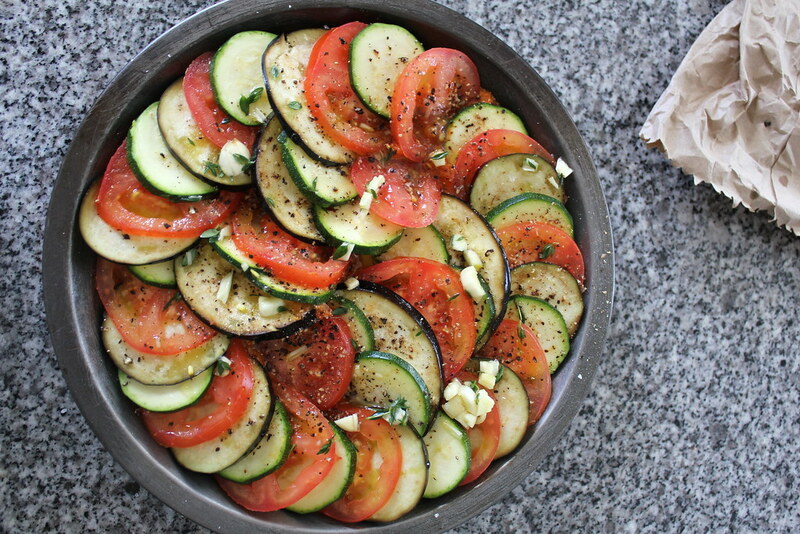 Sprinkle in the Italian herbs. Lower the heat and cook for about 20 minutes. – Then puree the mixture with basil leaves in a blender. 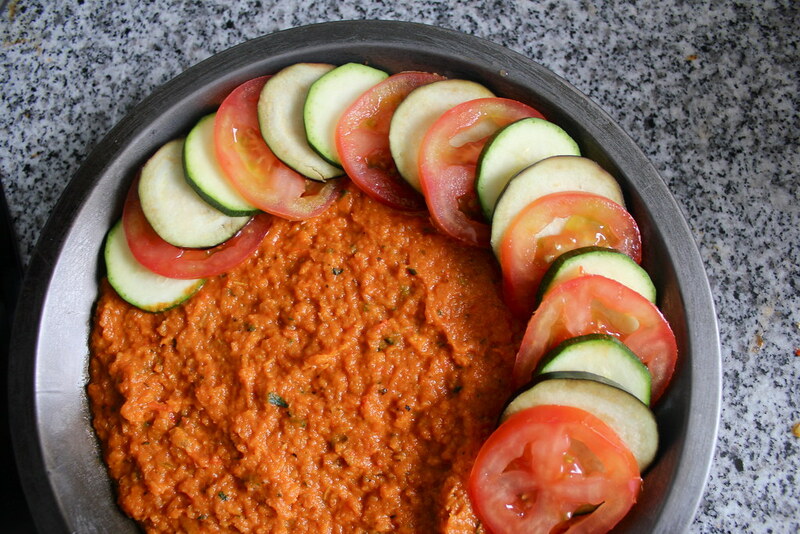 – Place the mixture back in the pan or a different baking dish. Spread it evenly. 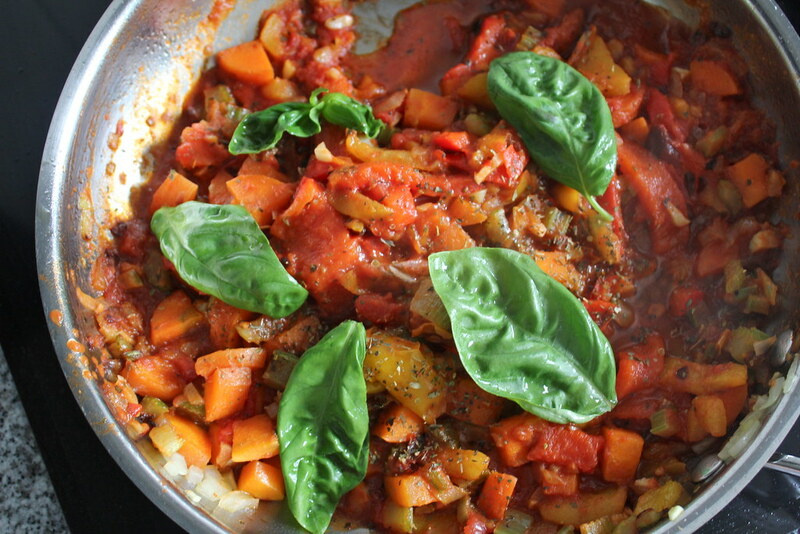 – Arrange the sliced veggies in alternating order on top of the piperade mixture. Do this until the whole pan is filled. 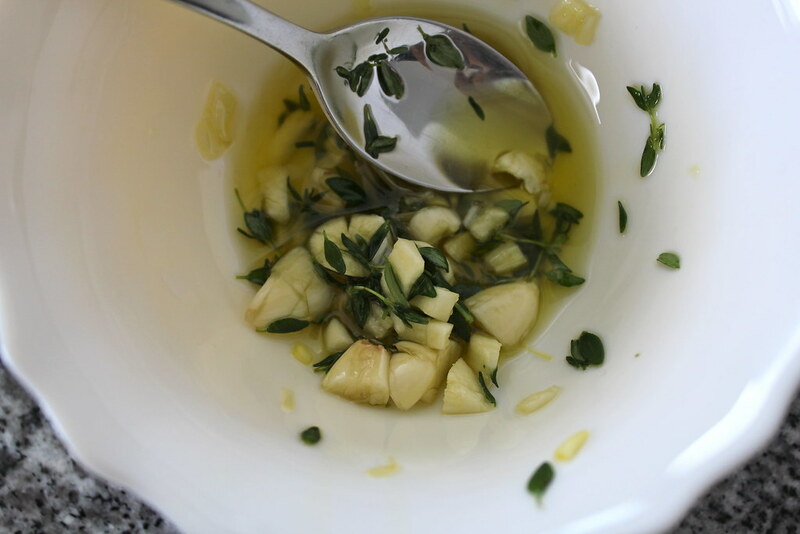 – Combine the seasoning, olive oil, minced garlic and chopped thyme. 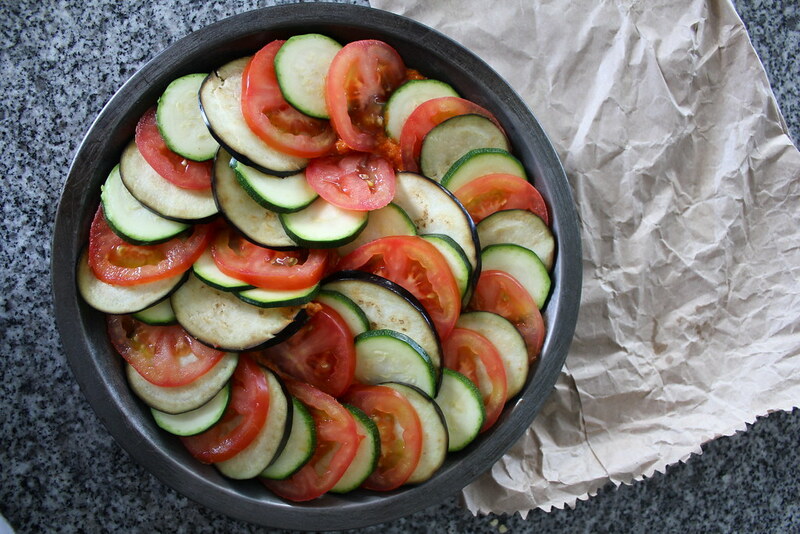 Drizzle all over the vegetables. Add salt and pepper to taste. – Cover with foil and bake in the oven for 2 hours. 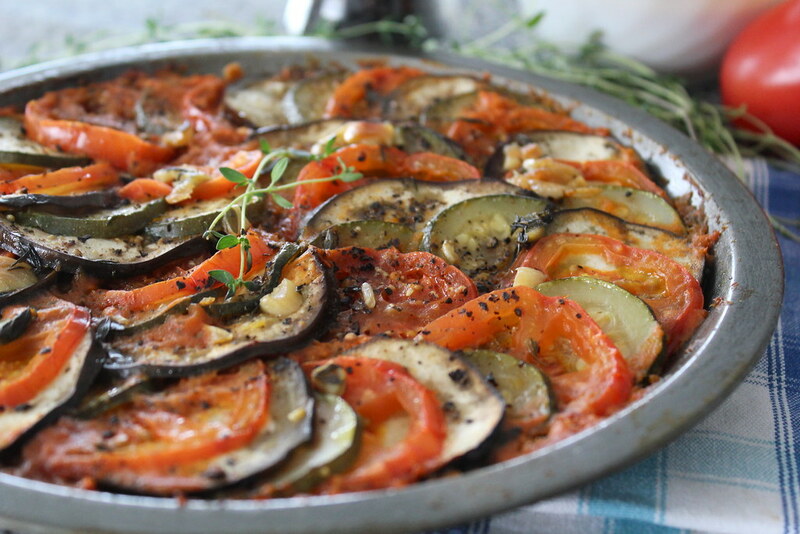 My first time ever trying out ratatouille! Yay soooo I’m going to add it to the awesome monthly link party Our Growing Edge. This event aims to connect food bloggers and inspire us to try new things. This month’s host is Leah from Sharing The Food We Love. Gorgeous photos! 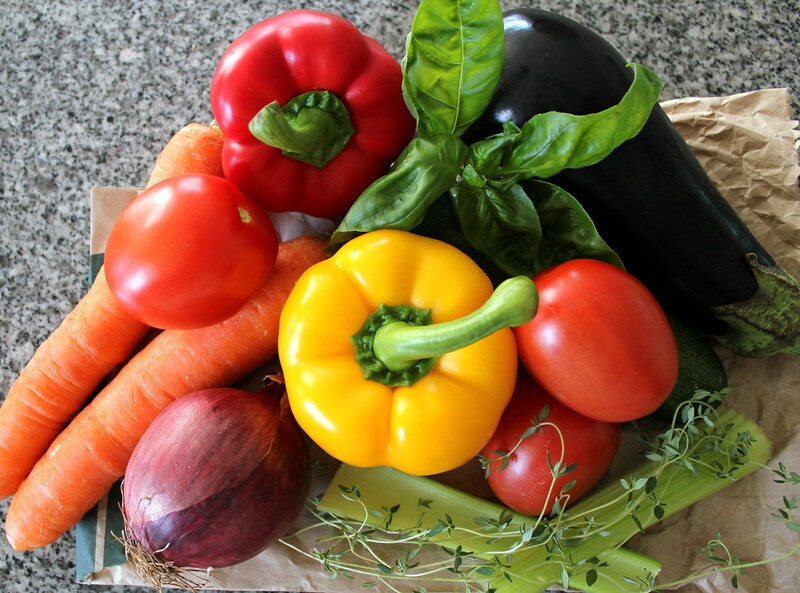 What a great way to use up lovely summer produce. Thanks for submitting this to Our Growing Edge this month Marnelli.